Please note that self-requests are not encouraged and will not generate a response from TLCB Team. Before submitting a creation for consideration please read The Lego Car Blog Submission Guidelines, and you can find answers to some frequently asked questions here. This is by far the best 6-wide DMC Delorean i’ve ever seen. It’s a nice creation for sure, but maybe a bit simple/plain for this blog. It’s nice to see good instructions though. The best minifig-scale land Rover I’ve seen. A nice suggestion, although the pictures aren’t great – do you know if this is available on any LEGO-related or image sharing sites? I don’t think so but I will check. I found this quite amazing. I know you discourage self-submission but as I only manage to finish one of my cars every four years or so I thought I’d at least bring it your attention. If you feel it makes the cut I’d love to see it here. Keep up the great work team! Love the quality on display on this site. That is a superb car, and it’s perfect for this blog. However, the pictures are borderline. A sharpen using the auto edit in iPhoto or similar could make a huge difference to the colouring. We can do this, but we much prefer using photos as they are (for time reasons!). Can you look into sharpening the main image and a 3/4 rear for us? We only blog recently uploaded creations, so we can’t feature your suggestions. You can read our submission criteria via the link at the top of this page. A wonderful rendition of the Initial-D Hachi-Roku! That’s a very accurate render, but it is still a render, and we primarily blog Lego creations rather than digital ones. A wonderful toyota AE86 Initial-D replica on flickr! Hey, legocarblooger, I think this is a cool trophy truck ! It’s a nice build however it’s not quite good enough to appear here. It meets our criteria and will be blogged after the weekend. Both suggestions are good, but don’t quite make it this time. Thankyou Gatty. That certainly is pretty special and will be blogged shortly. I’m not sure if you have seen it before, but for me this buggy is a top now! A real hot shot. Your suggested creation meets our criteria (we this – we can actually tell how old it is) and will be blogged shortly! Digging this Huayra from one of my favourite builder’s, Geoffrey Welch. Adore his Cartoony 6-wides, and he isn’t afraid to show some studs. Hope you like it! However, we have received a few suggestions of this builder recently so we are now aware of them and will watch for future improvements. I’ve found a freaking cool Karmann Ghia on MOCpages. but the red model is built with real bricks. Your suggested creations meet our criteria and will be blogged shortly! That’s a stunning model – but we’d need pictures on a clean background in order to post it. Is this one of the Lego Eurofighter OK? Its 1000 bricks and a Kg in weight – takes 12 hours to assemble. oh, forgot to mention fully retractable undercarriage and pilot minifig – you can just about make him out in the photo! Apologies, because these models produced and sold for profit we cannot feature them here without clearly saying so. TLCB has very occasionally featured ‘third party’ products in the past, but only when a copy of the product or service has been supplied to enable us to write an honest review (which could be good or bad). These can be found in the Set Reviews tab within the main menu. How do I submit a kit for review? How about the Baja Boot? Your suggested creation meets our criteria and will be blogged shortly. Hey guys! Came across this lovely DB5 today. Hope you like it too! A good model, but not quite good enough this week as we have some higher quality builds in the queue. Thanks though and keep them coming! Okay. I will say to keep on eye on him – his built a few really nice cars in the past, and looking at this model, he’s improving further still. What about this awesome moc? Hot Rod tribute Barris https://www.facebook.com/crowkillers/?ref=hl God bless. Put on the lego technic Land Rover series 1 done by jake kingdon on moc pages it’s really good ! It is indeed really good, however unfortunately the pictures are not of sufficient quality to be published here. If you click on full size image they are not so bad. Thanks for stopping by, and for sharing your creation with us. If you’re not yet on MOCpages, Brickshelf or Flcikr we recommend setting up an account so you can share your creations within the online Lego Community. Happy Building! Your suggestion meets our criteria, and we might be able to blog it, but this time it does depend on our current queue. Either way, good find! Thanks for stopping by. That looks clever! No images though?…. Your LEGO Ideas build looks great! Sorry though, we can’t publish it here because it’s not really car-related, nor is it built in real bricks, and it was also self-suggested (we get lots of Ideas requests). However we wish you all the best with your project, and to our visitors reading this – click the link in Tim’s comment above to see his Willy Wonker scene! Sorry, we do not accept self promotion. We think your audience will love them. Our last accessory was a hit – that was the carbon fiber tiles for LEGO that was a Kickstarter project about a year ago. We need you to attach a link to enable us to look into your suggestion – do you have one? Thanks for the link. We do indeed like your suggested creation (and we’re ‘following’ the builder too). However, as this creation was uploaded almost a year ago it is much too old to be blogged here. Hi Guys, I’ve found something on youtube I’ve never seen before, I thought u might find it interesting too. That’s a neat creation. If you have a link to images we can feature it here on TLCB – let us know if you do! Hi again, brickshelf link just appeared in the youtube description. At least I didn’t find anything at the first time so I subscribed to that channel. We like the way you think! So much so that this creation has appeared here already; https://thelegocarblog.com/2014/03/09/six-pack/ (whilst the image you have found is new the model was first uploaded back in 2013). You can see all of the blog posts featuring Norton74 by using the search function at the foot of the page. My friend João Campos, member from PLUG (portuguese LUG), did a fantastic two floors AEC Regent III bus, from the 50´s used in Lisbon from 1957 to 81 on CARRIS ( the Lisbon Bus and Tram Company). Just want to share a moc by geraldcacas again…. Whilst a good build, we won’t be blogging your suggestion on this occasion. A good suggestion, however we have featured an earlier version of this car here before, and thus we won’t be blogging it on this occasion. Fair enough. But I have more – this amazing Fairlady duo by Lego Bro blew my mind when I saw them. That is spectacular! And massive. But also alas we’re not sure there is a picture suitable for this blog, possibly because the build is so big. We’ll have a think about this. You have suggested this builder quite frequently – you’re not related to them are you?…. (self promotion is not encouraged here). He used to be my ex. But we’re in good terms now. My deepest apology if I’m becoming a troll on your site. Much appreciated your time replying and more power to your blog. Have a look at the page you won’t be disappointed. We have missed that one – and it looks great! Unfortunately it’s too old for us to post here (we only blog creations or images uploaded in the last week or so), however we can make an exception if the idea is about to reach a milestone, regardless of its age. If the Ideas project is about to cross a supports no. and you need a help to push it over let us know! Ever since attempting to build a Stratos, I car I loved to begin with, I’ve always had a thing for other Stratos models, respecting their effort. Peter’s RC one is no exception, and definitely deserves blogging. Please take a look at this Batmobile on Lego Ideas: https://ideas.lego.com/projects/132499. It has some cool gadgets and a unique design. Sorry, we don’t support LEGO Ideas projects unless they are close to a milestone and they meet our submission criteria. It’s a good model nevertheless! Post apoc school bus? why not? Your suggestion meets our criteria (although the pictures were borderline) and will be blogged shortly! Your suggestion meets our criteria and will be blogged shortly. That’s a nice model, but unfortunately it’s not quite of a high enough quality, or with good enough images, to feature here. Both your suggestions are good creations. The Caterham, though ingenious, isn’t complex enough to feature here, but the Tuk-Tuk may do. We’ll see if we can fit this in later in the week. I uploaded photo’s of my Mirage IV-P nuclear bomber. Maybe it’s interesting for you to blog. That’s an excellent creation. However, we have stated that we do not accept self-promotion as a submission suggestion. Your suggestion meets our criteria, however we are rethinking the frequency with which we post vehicles smaller than mini-fig scale. Vehicles such as this appear to be less liked by our audience than larger ones (according to our statistical analysis). If you’re a reader and agree/disagree with this feel free to reply to Alex’s comment and let us know your thoughts. I don’t disagree with Alex all scales are nice if the technique used is advanced!By the way I came across some photos of this creation https://www.flickr.com/photos/132941798@N07/18315504276/in/photostream/ at flickr and I liked it…so many details and functions in a so small car?Although it’s a render(I prefer real creations)…but I thing it’s quite interesting. P.S I don’t know how to upload a link…would you mind telling me? P.S I don’t know how to upload links would you mind telling me? Thanks for your feedback. Your suggestion, whilst a nice design, has much too low quality rendering to be suitable here. Thanks for stopping by. One of your suggestions meets our criteria and will be blogged shortly! Some old school brickwork here. Makes a change from all the bows and NPU. Whilst a nice model it’s not quite of a high enough quality (either the build or the images) to feature here at TLCB. We do like old-skool though. A good suggestion, however on this occasion we won’t be blogging it as we placed some bigger creations ahead of it. This model has been featured here already – use there search function to find it! This builder does a bunch of other stuff but this is the first TECHNIC MOC he’s done. Limited use of flex axles is intriguing, he has a lot of potential. Your suggestions meets our criteria and will be blogged shortly! Hello TLCB Team! Would you be interested in blogging this Donald Duck’s car by LegoJalex? Thank you for your time to read this suggestion. have you seen Sariel’s latest creation? We have indeed. It’s in the queue and will appear here soon! A good find that does meet our criteria, however at the moment we won’t be blogging this creation as we have some larger models in post. I was hoping the transforming function squeezed into such a small model would be interesting enough… Anyway, I’ll keep on bricking. thanks for suggesting my Camaro. Have you seen Gabor’s fantastic RC KITT? Your suggestion meets our criteria and we may publish a post soon, although we do have some larger models scheduled as a priority. Wow – that is a spectacular creation! However, we’re struggling to find an image good enough to appear here. However, your previous suggestion will be blogged shortly! That’s a very good model, but unfortunately we’ll need images with a clean background in order to publish it here. It’s all he have. Will it help? It may lack a little aesthetically, but full tuneable suspension, an 8-speed auto gearbox and MINDSTORMS drive in a 1:10 car? I’ve finally found something that trumps the 8880! Unfortunately, I haven’t managed to find this exact MOC anywhere else – seems like it’s only on Youtube. That’s a very interesting find! We’d need images on a Lego-sharing site in order to blog it though. -ish. Unfortunately these aren’t of a high enough quality to be used here, but thanks for looking for us! Here’s a pretty cool rally car. His other work’s good to. Those are good build but not quite of the calibre needed to be blogged here. That’s a good model, howeverunfowrtunately the images are not good enough for us to share. Hello, I found this Porsche Turbo on MOCpages, The small Flat 6 is interesting. That’s a nice model, but it’s not quite of a good enough quality (images too) to feature here. Greetings TLCB Team, may I suggest 8-wide Ford GT40 Mk1 by ZetoVince? His work is indeed pretty cool! We’d need higher quality images to be able to feature him though. A good model, but not yet good enough to appear here, although the Elves are now watching this builder improving. Your suggestion is in the queue and will appear shortly! I guess you already noticed this one, but if not, time to steamroller your elves. Looks like we’ll have to hire a steamroller! Great find, it’ll be blogged shortly. Your suggestion is a nice model. This builder hasn’t quite reached the standards needed to appear here yet, but we’re sure that they will in time. …And I thought you might be interested on this guy, sometimes he make some cool RC cars… Link: http://www.moc-pages.com/home.php/99234. And thanks to carolina pink for your suggestion! Your suggestion meets our criteria, however we have a few large posts scheduled currently so at the moment we won’t be blogging it just yet (but we may be able to later on). It is a good find though. What a great find! Your suggestion will be blogged shortly! I know you don’t acept self-requests, but I’m making a car contest to wake up MOCpages, so I thought you may be interested. The link to the group: http://www.moc-pages.com/group.php/25882. Sorry, we are not able to endorse competitions here at TLCB as we receive lots of requests for support. However, should a vehicle or vehicles be blog-worthy and appear here we absolutely can link to the competition in which they are entered. Best of luck waking up MOCpages! Your suggestion meets our criteria… would you like to Guest Blog it for us? If so reply here and we’ll hook you up! Should I send the text to the usual email address? I found a great-looking small RC VW T1, time ago you said carry on camping, that’s what he did! This looks not-heavy-at-all-but-sure-fast, so, I thought you may be interested. Thanks for stopping by. Your suggestion is in the queue and is due to appear shortly! I am sure the elves love this little beauty. Thanks for stopping by. We’re awaiting a photo of this design in real bricks. This is all I could find… http://www.eurobricks.com/forum/index.php?showtopic=123243. A good suggestion, however unfortunately the images on MOCpages aren’t a high quality (the photos are well taken, but the image, when blown up, is a bit fuzzy). Thus on this occasion we can’t blog your suggestion. Thanks for stopping by. That’s a very cool design, and something we would consider publishing here – however unfortunately the images are not of a high enough quality. Nevertheless, a good find. I’m happy that you liked it that much. Mysterious name…. thanks for stopping by anyway! Your suggestions meets our criteria and will be blogged shortly! These two ideas suggestions are good. Maybe you could blog them to help them gather support? We’re in contact with the creators of the Fiat 500 and are waiting for them to build their design in real bricks. Once they have built it for real (and send us their pictures) we’ll be blogging this creation. There are these two ideas sets that are doing reasonably well. Please blog them so they can gather support and I can buy one! Your suggestion meets our criteria and has been blogged today! Hey guys, how did I post a pick for you guys to see? If the image you’d like to share is already on the internet you can include the link to it in a comment. If the image is not publicly available we recommend making it so. The most popular methods are MOCpages, Flickr, and Brickshelf. Sorry, I just made a self-request. Just read that’s not the idea. Please ignore. No problem. It’s a great model though. If you have a Flickr/MOCpages/Brickshelf account let us know, we’d like to Follow you. Here is the link https://plus.google.com/118387266784242083218/posts/BjcaWscZuSm. We don’t accept self requests but keep up the building! Sariel has made a cool Tatra Dakar Truck. Don’t worry, the Elves have spotted it! Hi Markus, It’s a fine looking car but it would be great if he had some well lit photos with a plain background. If there are some new photos, please let us know and we might send some Elves round! A rather unusual background, but maybe the Elves like it. Your suggestion now meets our criteria and will be blogged shortly! Thanks for your suggestion. We’ll be blogging it soon. After all of the “Bonk, Smash, Thud” on MOCpages, the Elves don’t visit it as frequently as they used to. We sent in some Elves with magnifying glasses to look carefully at the pictures on MOCpages and unfortunately they’re renders of LDD. At the moment, the Elves aren’t big fans of virtual Lego creations, though this might change in the future. Thanks for your suggestion but unfortunately it doesn’t meet our current criteria. I didn’t see it, sorry. This is a cool truck and I can ask the builder to take better pics if you guys need. A nice model but we’d need better photos to blog this. Hi Nathan, We’ll be blogging this soon, having found the better quality photos over on Flickr. Thanks for your suggestion. Thanks for your suggestion. It meets our criteria and will be blogged shortly! That is a cool truck, and it’s photographed very well too, but it’s not quite a good enough creation to feature here. Close though. But this is a vehicle. Thanks for your suggestions. The first does not meet our criteria, however the second does and will be blogged shortly. Please also take a look at our Submission Guidelines, as we only blog creations that have been uploaded in the last week or so. Thanks for your suggestions. It meets our criteria and will be blogged shortly! Sorry, I thought it was. Thanks for your suggestion. It’s not quite of the standard needed to appear here unfortunately. Thanks for your suggestion – we like this a lot! Is there a link to an online account (Flickr, MOCpages, Brickshelf etc.)? Sorry, this is a 2012 model. We only blog creations that are a week or two old. You can see when a creation was uploaded by the date at the bottom of the page on Brickshelf. This is one of the best pneumatic things ever. Thanks for your suggestion. Sorry, the pictures are not of a high enough quality for us to blog this. Efferman has made a cool MTS Dino Suction Excavator I don’t know if it is done. Thanks for your message. We require a link. Please only suggest finished creations, as we do not blog WIPs. Thanks for suggestions. A nice model, however the photos are a bit ‘close’ so on this occasion we’re unable to blog it. Thanks for your suggestion. That’s a brilliant creation, but unfortunately we’d need much better images to be able to blog it. Thanks for your suggestion. It’s a very good creation, but unfortunately without very good pictures. I know the pictures aren’t good enough for you, but we (People of the ‘pages) are in contact with the builder to make him take better pictures. Thanks for stopping by. Your suggestion meets our criteria and will be blogged shortly! This model is in the queue and will appear shortly! Thanks for your suggestion. It meets our criteria and will be blogged shortly. Jeepy Jeep! Found it on Mocpages, and for better pictures you can visit the Ideas page. Hi TLCB, I know you don’t like LDD but I saw you making an exception, and I don’t want this blog to become a digital-lego-car-blog but this is a really cool car that deserves to be blogged, and it’s even got a 360 view! Thanks for your suggestions. It’s a very nice design, but as it’s digital we won’t be blogging it. Thanks for your suggestion. This is a pretty good model (borderline for TLCB), but unfortunately the images aren’t helping the case. First, I really want to thank Saschaanton for the suggestion, so: thanks! Second, to TLCB, I found this 911 http://www.moc-pages.com/moc.php/434972 on Mocpages and I can take better pictures of the Isetta if you want. Thanks for your suggestion. It met our criteria and was blogged today! do you want better pictures of the Isetta I made? We would always recommend taking as high quality images as possible. Your creation would be a bit old now, but one day you may well appear here – just keep improving. Try not to focus on being blogged, build because you enjoy it! I’ve found another one! As you might know I’m a big fan of 4-wide “Tiny Turbo” models. I know you don’t post these small models very often, but I think you might do so with this one. Would you like to join us to guest blog this one? Thanks for your suggestion. An Elf returned with this today and it’s in the queue. We like your thinking – it’s in the queue! We don’t get into disputes such as this one, as it’s something that the affected builders and eBay’s administrators are more capable of dealing with. Thanks for your message. Yup, it’s in the queue! Thanks for your suggestion! It meets our criteria but we have a few other things to post so we may not get to this one, but we do watch this builder! Oh wait. I didn’t see Ivan suggested it. Chinchy’s made another 911. Old school, with a modern heart, and it uses his awesome 3D printed rims. Thanks for your suggestion. It meets our criteria and will blogged shortly! have you seen this “goddess”? For me it’s just perfect! We have! It’s in the queue and will appear shortly. Thanks for your suggestion. 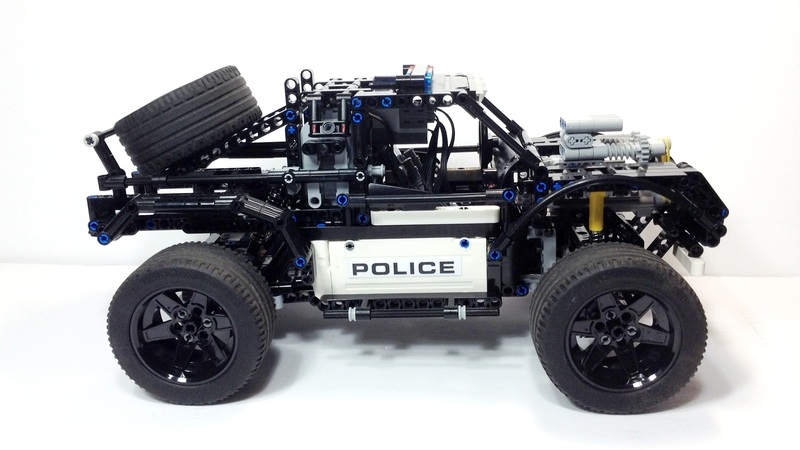 We’re not sure why a ‘B-Model’ would need to be on LEGO Ideas, but it does meet our criteria and will appear shortly! Thanks for your suggestion, it’s already in the queue! This creation was blogged today! Would you like to guest blog this one? Thanks for your suggestion. A good model well photographed, but not quite as good close up, so we decided not to blog it when one of our Elves brought this back earlier. Thanks for your suggestion. We like the way you think! This one’s in the queue and will appear shortly. Thanks for your message, that’s a lovely model. Do you have a link to MOCpages / Flickr / Brickshelf etc.? We don’t publish anything directly from Ideas on request, as we receive loads of Lego Ideas messages and we’re careful to remain impartial where possible. If you have a link to another site and the model meets our guidelines then it could appear here. Don’t worry, it was in the queue already and it’s now been published. Thanks for your suggestion. That’s a cool looking model but on this occasion we won’t be blogging it. I’ve found cool alternate Hotrod from Mini Cooper https://www.flickr.com/photos/buildme/31740473873. A nice model, although not quite at the standard needed here. It’s also very similar to this MX-5 that we blogged a few weeks ago; https://thelegocarblog.com/2017/01/15/mazda-mx-5-miata-picture-special/, but we are watching this builder for future blog-worthy builds. This one’s in the queue and will appear shortly! Lovely little MX5/Miata/Eunos/Rustbucket here, with working pop-ups, and very good pop-ups at that. It meets our criteria (although it does look a bit short), but we have a bit of a queue at the moment so we probably won’t blog this one as we’re have a few more varied things to publish this week. Thanks for your message. This model was published today. We often schedule posts rather than publishing finds immediately, so it’s probably best to wait a day before suggesting a model as it may already be in the system. Thanks for your suggestion. It’s already in the queue and will appear shortly! Thanks for your suggestion. An interesting build, but more a tool than a vehicle, so on this occasion we won’t be blogging it. Thanks for your suggestion. It meets out criteria and will be blogged shortly! Maybe worth to mention – finally with live pics. Thanks for your suggestion. A good model, but the pics (and model itself) are a bit dark to be blogged here. We’re watching the builder now though. I have made an moc of the vw t1 long. It is an XXXL version with PF for driving, steeringvand lights. Hope you like it. Thanks for your message. That’s a nice creation, however we do not accept self-requests. Thanks for your suggestion. It’s in the queue and is due be blogged shortly. I know you tend to shy away from virtual brick submissions but I feel that this masterpiece, which I spotted in Lego Ideas, is an exception. Thanks for your suggestion. It is indeed, but it’s a bit abstract for us here so we decided not to blog it when one of the Elves found it earlier in the week. I just have found on Brickshelf a Kress 200C Caul hauler made by someone called “Super-koala”. Probably not the best creation you can find, but (correct me if i’m wrong) it is the first time someone do this truck with Lego. It changes from classical dump truck. There is also some other interesting creation in the Super-koala’s shelf. Thanks for your suggestion. What a weird (yet good!) build! Probably a bit too weird and maybe a little untidy to be published here, but thanks for the bringing the builder to our attention, we’ll be watching them from now on! At least I’m happy if you discovered a new Lego buillder. Thanks for your suggestion. We’re won’t be blogging it this time but we are now following the builder on Flickr, as they look to be a possible future bloggee. p.s. thanks for supporting my work! Thanks for your suggestion, that’s a brilliant and brilliantly photographed build. However, as it’s a re-build of someone else’s model (which we’ve featured here before) we aren’t able to blog it. I manage a Youtube channel on which I share Lego train related videos. Another hobby of mine is mountaineering. I’ve combined these two hobbies by setting up a Lego train track high up in the mountains and made an awesome video of it! If you haven’t seen it yet have a look and feel free to use it on your website. I hope you like some (all?) of them! We like your builds very much! If built in real bricks, and uploaded to Flickr, MOCpages or another creation-sharing site, we would definitely consider blogging them. Let us know if that can happen! I have now uploaded some additional Lego Speed Champs car projects on my MOC pages. So please have a look and let me know if you are interested by these projects …and profound apologies for frustrating your little elves by not giving them the opportunity to play with them straight away! With or without my projects, I cannot wait for you next edition of your blog; it is witty, very instructive and imaginative. My daily ray of sunshine really! Your pages aren’t visible yet (they require a moderator at MOCpages to activate them first), but we’ll check back in a few days when they’ve been approved to appear publicly on MOCpages. Please have a look at them; hopefully you will like them to consider for your great blog! Many thanks for your patience, the MOC pages have been finally approved and can be accessed now. A 205 is on TLCB today. Send us a model if you reach 10,000 get approved! Blog and amongst so many brilliant vehicles / neat ideas you have promoted so far. So you have made my day and I can’t tell you enough how grateful I am. I can wait for your next edition of this super blog. First I apologies for my poor english, I am from France ! If you can tell what you think about them and which one you prefer. I thank you much for your interest and I hope you can enjoy my work ! Thanks for your message! Do you have a MOCpages, Flickr or Brickshelf account that we can view? Thanks for you suggestion. It meets our criteria and will be blogged shortly! It’s one of the best custom cars and the development history and the documentation behind it is also outstanding. It is not done but when it is you should post this. Your suggestion was blogged upon its completion. This guy made a fantastic mod from the Ferrari F40 Creator, making a version of the racing Ferrari Shell from the 90’s !! Just finished this Zonda 760 with the new BuWizz battery/reciever. Check it out and see if its blogworthy. Thank you. We don’t accept self requests. You can find all the rules in our submission guidelines via the link at the top of this page. Wow, aaron’s Zonda is really awesome! Thanks for your suggestion. It’s a good well-presented build, however as the builder has titled the model as a replica of a real car they have set the bar a little too high for themselves to be blogged here, as real cars must meet a more exacting standard. It’s a well-executed build of a rather funny vehicle. This is a good model, but as we featured this builder last week and have a queue of models to publish we won’t be blogging it on this occasion. Thanks for your suggestion. A good model, but not quite good enough to appear here (plus it’s digital). Thanks for your suggestion. It meets our criteria – would you like to join us as a guest blogger to publish it? Let us know by reply and we’ll send you details. I have never done something like that but I would like to give it a try for Nathanael’s alternate model. Great, click the ‘Contact Us’ link in the menu, fill in the form (which privately gives us your email address) and we’ll contact you directly. Thanks for your suggestion – it’s in the queue! Found this nice Ferrari F1 car on Flickr by ekjohnson1. Key features are the antenna arms for the suspension rods and the use of the speed champions sticker sheet! Thanks for your suggestion. A nice model, but a slightly blurry picture unfortunately. It’s a duff link unfortunately, but we think we know the model you mean as one of our Elves found it too. If so expect it to appear here soon! Thanks for your suggestion. It meets our criteria and has been blogged! have you seen 8 Wire’s Batcave in Minifig scale filled with lots of vehicles? Thanks of your suggestion. That looks very cool! However the images are of poor quality so unfortunately we are unable to blog it here. Thanks for your suggestion. It’s in the queue and will appear shortly! Lachlan Cameron built this amazing Ford GT, and hopefully will mske a video of it soon enough. have you seen this Technic monster? We have! It’s up today! I’m also not sure if you’ve already posted some of Legomarat’s other models, such as his datsun 240Z, but if you haven’t, there are some more ideas. This is *very* old (we only blog creations uploaded in the last week-ish), so this wouldn’t qualify. If not already in the queue, you should blog Carter’s new BR2049 Spinner. I know there’s a few of these around now, but this one is particularly detailed and accurate. Thanks for your suggestion, it meets our criteria and will be blogged shortly! Photos aren’t amazing but the build is a riot of character. Thanks for your suggestion. A lovely model, but it needs images with a clean background for us to publish it here. Have you seen a dirt bike at this scale? Thanks for your suggestion. That’s an excellent build. However if the upload date is accurate it is too old for us to publish it here (let us know if otherwise), as we only blog creations posted in the past week or two. However, we have ‘Followed’ the builder for future creations. This must be a pretty busy period for you, with Xmas approaching. Chin up, you are doing a wonderful job!! Cheers and All the Best in Winter Wonderland!! Thanks for your message, it’s always good to hear from a past bloggee! All of your models meet our quality standard (horay! ), but all are too old to be blogged here, as we only post new content (plus we don’t accept self -requests). As per your suggestion, I have done a group shot of my Italian Classics – Speed Champs format. Many thanks to Troy Schafer for the heads up and thanks as well to the elves for their interest in my model! Hipe this helps and thanks again! Thanks for your suggestion. It meets our criteria, would you like to guest blog it for us? Send us your text via Flickr mail if so and reply here to let us know! You will of course be credited in the text. It sure is! Great to have you as a guest writer. Here comes a Speed Champions Set that you might like. This is based on digital models, that have finally been converted into real bricks projects. Hopefully this tiny set meets your expectations (it is all new, pic quality is OK…). The only downside is that I am actually the creator of this set (I was so excited to have produced them in real, that I could not wait for another Lego fan to spot the MOC page). Sorry for this little ‘breach’ of rules but it is for a greater brick good, I think?. I can say that I’d suggest this double MOC here too. So if it’s OK for the TLCB team, it would be cool to see these beauties posted :-). Thanks for your message. With a few plain background images these would meet our criteria. We’ve messaged the bundler (see above) accordingly. Many thanks to you and Nils for your nice words and suggestions – I have uploaded some new pics of the tiny Pug 205 and its transalpine rival, the Lancia Delta. This time, I have opted for neutral beige background, because it works quite well with the white main colour of both models and, somehow, it does remind of the exciting dirt produced by a rally car in action. I feel these pics are much better than the previous ones, but I am no photographic expert, unfortunately. So, I leave to your wise judgment and look forward to any further feedback from you. Stick them on a white (or another colour) plain background (paper will do), update a few images, and you’re in! Thanks for your message, always good to hear from a previous bloggee. We have indeed, it’s in the queue and will appear shortly! did you see David Robert’s “Big Red 23”? It’s not only a big stylish NCS rover with a cool interior. It also has some neat Technic features including Ackermann steering system, rear suspension and PowerFunctions RC. Thanks for your suggestion. It meets our criteria – would you like to Guest Blog it for us? If so reply here and send your text by Flickr Mail! I don’t have an adress for Flickr Mail, but I have the Rocketmail adress. Is that one OK? Lego Builders made an LFA. It’s outstanding! Thanks for your suggestion – it’s in the queue and will appear shortly. Thanks for your suggestion. That’s a nice looking design but s it’s digital-only we can’t blog it here. A Renault from a new era. Thanks for your suggestion. That’s a nice well presented model, however it’s not quite good enough to appear here. Ted @ndes, Cole BlaQ & _zenn. Thanks for the heads up, something will appear shortly. We’ve also sent you a FlickrMail. I think its a very great work and should become some more attention and fame. Thanks for your suggestion. We don’t usually blog LEGO Ideas projects, however as this model is on Flickr and MOCpages and it meets our criteria it will appear shortly! Did you see this massive thing? We did! However as this model has appeared here before (https://thelegocarblog.com/2016/04/19/unstoppable/) we decided not to republish it. But that was a 8×8 truck, not like this 4×4. That’s good enough for us, your suggestion will appear shortly! And this has nothing to do with the massive Elven tantrum that will occur unless we blog it whatsoever. I’ve found this cool BTTF DeLorean Transformer on MOCpages. I’m not sure about the photo quality, but the car/robot looks great. Thanks for your suggestion. The car/robot do look great! However you’re right about the photo quality, which is not good enough for the model to appear here – sorry. Daniel has added some better photos of his MOC on flickr. Thanks for the update (and for helping out a fellow builder too – that’s great to see!). They are indeed better, but still a bit borderline, which as the model itself is borderline too means we won’t be blogging the builder on this occasion. However we have now ‘Followed’ them on Flickr to watch for future builds. Image hints; natural lighting works best, you can take an image from further away and then crop, and ‘auto enhance’ works wonders sometimes too! Here’s a Ford Fiesta WRC build which, at a glance looks just like the Speed Champions set… until you look closer. Rebuilt at 7-wide and packed full of details: engine, interior, some roll cage, opening hood, trunk… It’s very cool to see a fresh new TLG set reinterpreted in a way which both shows off the potential of the new parts and the ingenuity the SC series inspires in builders. We like the way you think – it’s already in the queue! I’ve found this monster built by Jeroen Ottens. Lots of details in such a small package! It meets out criteria, would you like to join us a Guest Blogger to publicise this? If so reply here and send us your text via Flickr Mail! Hi, I’m a avid follower of your blog. Would like to recommend a creation from a good friend of mine. Hope this meets your criteria. I know you are working very hard and hope you will soon have a well-deserved and nice Summer holiday. I hope both meet your quality criteria. Wishing you all the best and looking forward to some more exciting blogging from yourselves. Those are (more) lovely creations from you! The image quality, being MOCpages, is a bit low though, so we’d recommend also posting to Flickr, or using Flickr to host your images on MOCpages, as the quality is higher. I agree with you: The MOC-Pages Website does deteriorate the Quality of the uploaded photos. I hope you will find them good enough to go on your wonderful blog. However we may blog the tanker in its own right, depending on what’s in the queue.